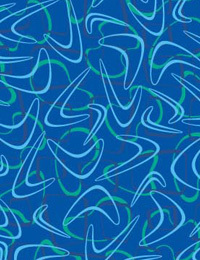 Does anyone out there have any turquoise boomerang formica laminate? It's no longer manufactured , but hoping someone has some extra in the garage from their renovation. Wilsonart makes a similar one called 'retro diner', not sure if turquoise is available. Sometimes independent shops have new old stock, when I was coving my kitchen floor, I was able to find the banding needed at a flooring store that had been in business for many years, most places didn't even know what it was. Thanks for the suggestions and the photo! I think I might go with the Domino Retro by Wilsonart, but boy-O-boy is it pricey...Heffron (sp?) has it but it's over $300 a sheet and that's not including S&H. I very good at not cheaping out when it comes to the Boler, but to pay that for a design I'm not totally sold on is a pain...I might just find a great fabric and do a resin sealed table top! Beverly - Try calling Major Brands Flooring - 425-623-3550. They will able to order Wilsonart for you in many different size sheets. It only takes a day or so to get. They are on 1st Ave S in Seattle across from the Starbuck headquarters.